Today’s Friday show and tell topic was “My dinner” . We brought in drawings or wrote down what we ate for dinner the night before, and discussed them. 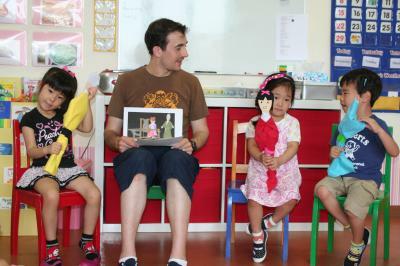 Today we practiced our Tanabata play with puppets, and we will perform it for our parents at our summer party. We hope they like it! We continued working on the pinatas that we will use at our summer party. 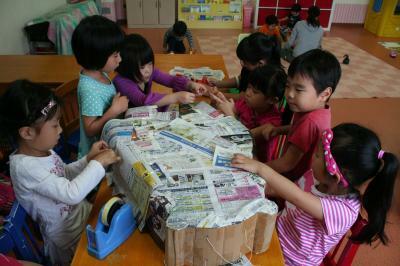 Today we pasted on newspapers using glue we made from mixing flour and water. It’s called paper mache. 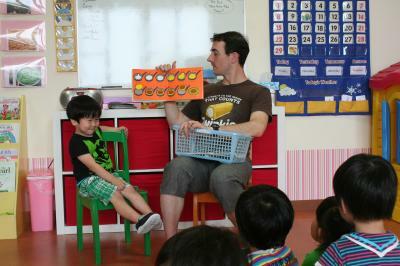 Today we played the classic English game,” Fruit Basket” at morning circle time. We divided into four groups, pizza, cookies, french fries, and donuts. We love “fruit basket” time the best! Today is Friday and Show & Tell time. Today’s topic was “My Favorite Food”. We brought in our favorite food or a picture of it, then explained why we like it. Our long awatied first semester Flamenco lessons have begun! 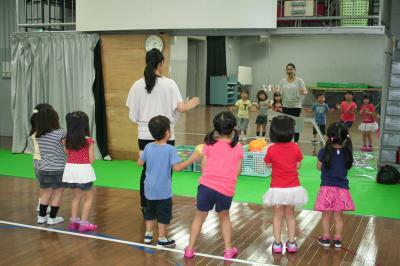 After reviewing our past dances, our teacher taught us some new steps. Flamenco dancing is fun! Today we continued working on a pinata that we will use at our summer party. We are making a big, black, round, red-cheeked, and very popular something. Guess who! 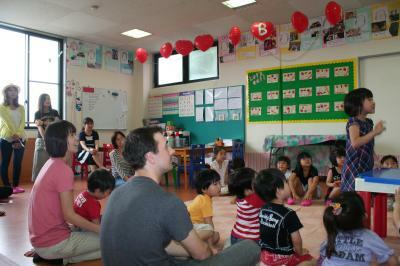 Today we held class observations for the parents of our younger students. 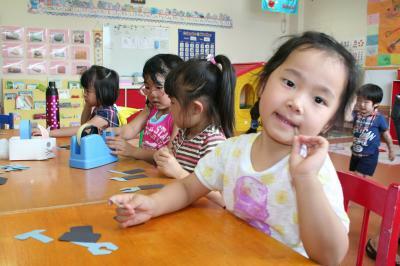 Today’s observation focus was on picture recognition, vocabulary, and phonics. 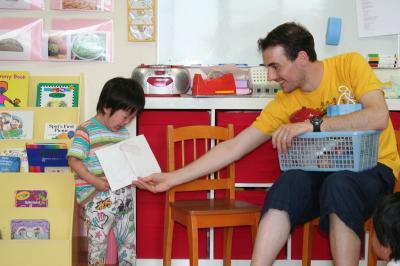 Today is Friday and Show & Tell time. 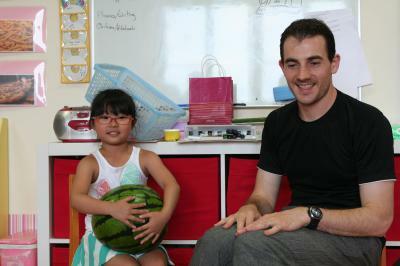 Today’s topic was “My Favorite Vegetable”. We brought in vegetables or drew pictures of our favorites and discussed them. 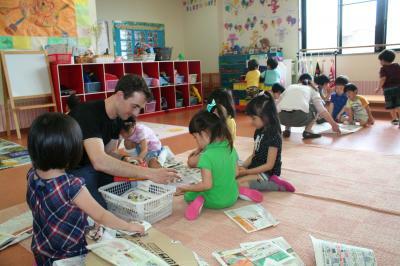 Today we made paper tools at art time. We’ll use them for a special project we’re making. We can’t wait to show it to you. 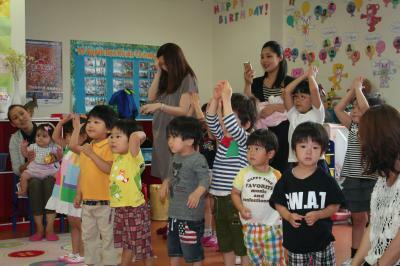 Every Wednesday morning we have music time. Today we practiced “The Frog Song” using our keyboard harmonicas. 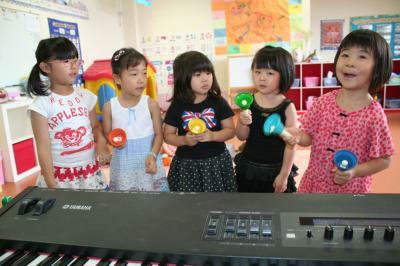 We also played “Twinkle, Twinkle, Little Star” with handbells for the first time. We love music time! 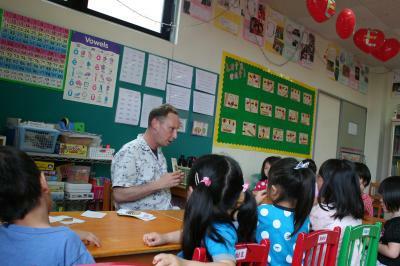 Today we held parent observations for older class students. We focused on monthly reading and word recognition. 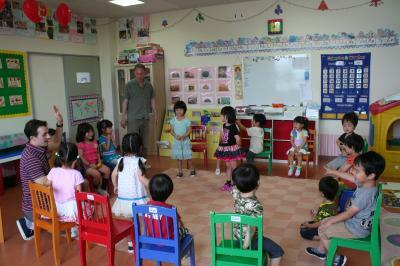 We did a resturant role play at circle time, and children were quiet and nicer than usual. Today is Friday and Show & Tell time. 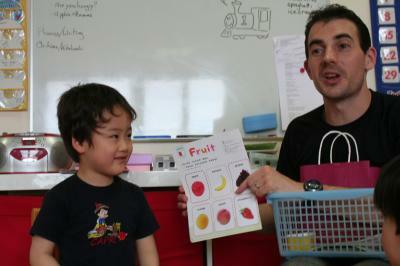 Today’s topic was “My Favorite Fruit”. We brought fruit in or drew pictures of our favorites and discussed them. 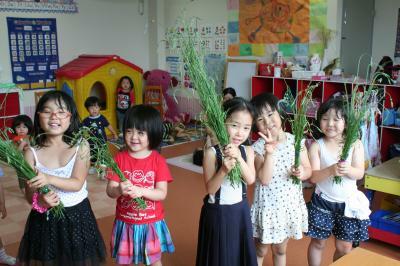 Today members of Oltana brought in some lavender that was grown on their farm. It smells very nice and will make wonderful dry flowers. Thank you very much Oltana! We started making pinatas. Pinatas are shaped ornamental paper stuffed with toys and snacks used in Mexican festivals and birthdays. Hung from trees, they are beaten by blindfolded children until they break open and the toys and snacks fall out (similar to Japanese suikawari).